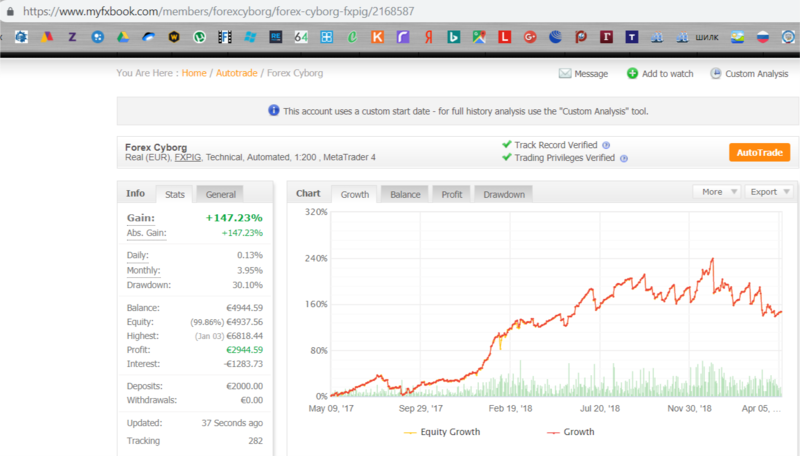 Forex Cyborg is a highly profitable and professional fully automated forex trading system for professional traders who are looking for long-term investments. The system includes neural networks and deep learning, works on your MetaTrader 4 trading platform, manages and closes transactions. When the market is open, Forex Cyborg is looking for the next lucrative deal. It has a very high odds ratio for several currency pairs in thousands of trades over 10 years, proving that it can make big money in any market conditions for a short, medium and long-term period. Forex Cyborg can be traded on multiple currency pairs with default settings on any trading account of any size with any leverage. You only need to adjust the lot size or risk for each transaction. You don’t need to risk a lot to make huge amounts of money with him, as he often trades and can quickly earn even the smallest trading accounts in large quantities. Forex Cyborg is suitable for both beginners and advanced forex traders to easily follow installation instructions, full support, lifetime updates. Real tick data used for testing gives the most accurate results. 99% of the quality of the simulation. The real variables used for testing help ensure that Forex Cyborg does not depend on dependencies. Real slippage is modeled in tests to predict various real trading conditions. Trading commissions included in the tests so that they do not devour profits. Can you confirm if this EA is free and how to do we get lifetime support with it. Do you assist with setting this bot up?